SEO Managers in large companies need enterprise-grade SEO tools. Because SEO strategies are on a grand scale, local SEO tools won’t cut it. But what’s makes Enterprise SEO tools more powerful? In this post, I’ll lay out what SEO managers should look for in Enterprise SEO tools. 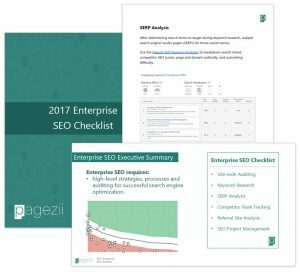 To take your Enterprise SEO strategy to the next level, download the Enterprise SEO Checklist. Google account integration for accurate data and metrics within your SEO tools. SEO competitor analysis to show how your site stacks up against competitors. Industry SEO performance trends to see if keyword targets are performing on par with trends. Potential keyword targets for new opportunities. SEO suggestion abilities for easy SEO and web team collaboration. Project segment overviews for SEO project management. And finally, automated weekly reporting to keep your digital marketing team in the loop. 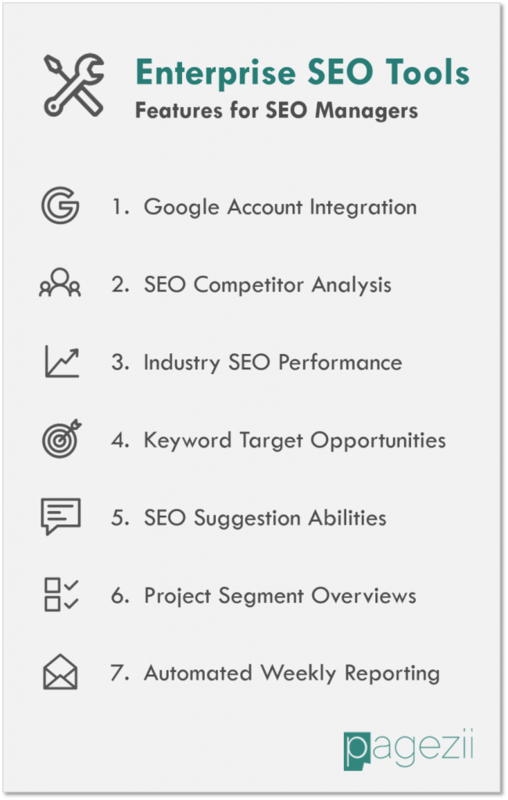 With this outline for Enterprise SEO tools, let’s get into each feature. When Enterprise SEO, you need actual data from Google. And the only way to get actual SEO data is with Google integration. Integration with Google Search Console and Analytics gives you SEO data like organic ranking, keyword CTRs, and views. Because you’re optimizing SEO strategies, you’re going to need these metrics. They’ll show you where you stand. After analyzing your own SEO performance, you need to see how you stack up in the industry. This means tracking competitor SEO. An SEO tool will always analyze your SEO performance. But what separates Enterprise SEO tools is industry analysis. This is because SEO at the Enterprise level is intricate. Competitors are always developing new content. You need a tool that is going to keep tabs on your competitors for you. This feature is similar to competitor analysis, but it gives you even greater visibility into SEO performance. When your competitors aren’t targeting the same keywords, you still need a performance benchmark. This is where industry SEO performance comes in. Having search engine-wide CTR averages for important keywords gives you a rough estimate of performance. If you see certain keywords are under-performing compared to industry averages, you know there’s work to be done. Enterprise SEO tools help you analyze, now it’s time for the next step: opportunities. Based on your existing SEO data, tools with a built in suggestion feature make SEO managers lives easier. Instead of doing the leg work for hundreds of pages, your tool should do the keyword research for you. You have the analysis and opportunities down, but Enterprise SEO tools don’t stop there. Now you need features to put SEO strategies into practice. This is where suggestions abilities make their way in. An Enterprise SEO tool keeps everything inside the app. You know how multiple applications can make your optimization process messy. Especially with larger digital marketing teams. Having SEO suggestions features for your site pages keeps your team organized and everyone on the same page. It also makes for easier SEO editing when you’re ready to pass pages on to the web team. Continuing with project management features, you and your team need to stay on top of SEO projects. This is when your team can use segmented project overviews. For each SEO project, you’ll most likely have multiple URLs you’re working on. But without segmented projects, URLs you’ve worked and ones you haven’t are hard to track. The projects overview will give you a real-time snapshot of SEO completion. This is going to keep you and your team on the same page from project start to finish. Last but not least, you need automated reporting. This keeps the entire team in the know. One of the toughest tasks for Enterprises. Getting an automatic report emailed to your digital team keeps everyone on track and highlights any red flags. You’re an Enterprise. And because you’re an Enterprise, you need tools with power. Without them, you’ll bog down with the mountain of SEO work that needs to get done. When looking for an SEO tool, make sure these features are present.